ZAMBEEF Products has joined the Veterinary Association of Zambia (VAZ) in raising awareness on the prevention and treatment of rabies in support of World Rabies Day. Zambeef marketing and corporate affairs manager Felix Lupindula said rabies was a serious condition that affected the nervous system and could lead to loss of life if left untreated. 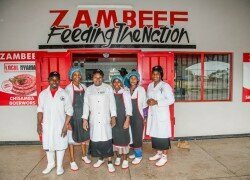 “The good news is that this can be prevented, and early treatment is vital to saving lives; that is why as a useful and effective corporate member of the community, Zambeef has partnered with VAZ to enable the message to be heard by the communities that need to hear it,” he said. Mr Lupindula said children were the most vulnerable targets in many cases and it was important to teach them to avoid stray dogs and wild animals. “We hope that at the end of the campaign, more people will be educated on the proper care of pets and how to make the home and neighborhoods safer for everyone. ‘‘Above all, everyone needs to know how to handle suspicious cases or an outbreak, should they occur,” Mr Lupindula said. And Veterinary Association of Zambia spokeswoman Dr Amy Kingdom announced that 22 clinics nationwide have so far signed up in campaigning for better rabies control and dog-bite prevention. Dr Kingdom said the association would engage communities in these areas by working with different clinics in organizing localised campaigns. ‘‘Zambeef has come on board as the main sponsor for this year’s campaigns and we intend to put this to good use as we seek to educate, vaccinate and eliminate rabies countrywide,” Dr Kingdom said. She said animals such as cats, bats and rabbits were common carriers of rabies with dogs topping the list of transmitters, adding that vaccinating pets against the disease beforehand could go a long way in preventing outbreaks or infections. Rabies is transmitted via bites and scratches from infected animals and can also be passed on by people already infected. Early treatment with the rabies vaccine is the only way to prevent the onset of the disease. If left untreated, rabies will invariably lead to death. An infected person or suspected case must be brought to medical attention immediately so they can be treated with the rabies vaccine at the earliest opportunity. Incubation periods for rabies can range from one week to three months or even longer.